Every human cell is outnumbered in our bodies by microbes, in a ratio estimated at three-to-one. We need these microbes to thrive, and sometimes they can kill us – but we don't know them very well. That's why ecancermedicalscience has prepared our latest Special Issue, focusing specifically on the "oncomicrobiome" – a phrase that readers may not be familiar with now, but which will play a large role in our future understanding of cancer. "Humans are super-organisms of massive interconnecting genomes from trillions of organisms that are all essential for maintaining health," says Guest Editor Dr Alasdair Scott of Imperial College, London, UK. The microbiome, or the sum of the genetic information contained within these organisms, is almost unimaginably vast – and incredibly complex, with thousands of relationships developed over our long history of co-evolution with the microscopic. "We're beginning to appreciate that the human microbiome impacts on nearly every aspect of human physiology and pathophysiology," Dr Scott explains. 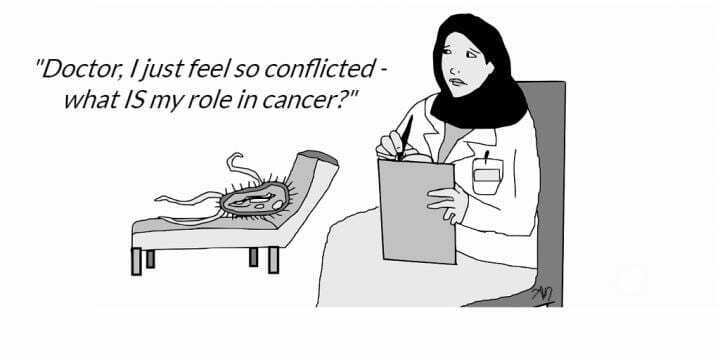 Now it's time to turn our attention to the "oncomicrobiome," the complex connection between cancer and the microbiome. "This cutting-edge Special Issue delves into our rapidly evolving understanding of the microbiome in both the causation and treatment of cancer," says Dr Scott. This Special Issue collects six original review articles that examine this complex relationship, ranging from the use of probiotics in cancer treatment, to the interaction of the microbiome with chemotherapy, to examining the bacterial infections that may lead to colorectal and lung cancer. The development of microbial DNA sequencing techniques and the rise of bioinformatics are also explored. All of the articles on this fascinating topic are completely free to read. You're invited to explore the potential of this inner world at ecancer.org. The journal is not for profit and only charges authors an article publication fee if they have specific funding for publishing. So far over 2000 authors have published for free. The journal is funded by the ecancer Global Foundation, educational grants, sponsorship and charitable donations.